The Cabana sports a modern hip-style roofline as its main feature. It replaces the standard gable roof seen on many of our sheds. 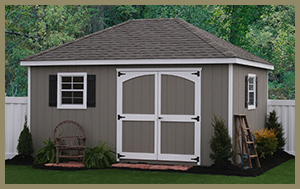 These symmetrical lines and quality craftsmanship make this shed a useful and enjoyable part of your backyard. The standard wall construction is 2×4 at 16″ centers. The roof is cathedral style, that give you space to manipulate article in the shed. Like all of our sheds, this one is built to last a lifetime. If you’re looking for a contemporary storage solution, the Cabana is a good place to start. Call or email us today for a quote.